Chevy Silverado 1500 (574,876 pcs.) and Ram 1500 (489,418 pcs). For comparison, among the cars of the most popular was Toyota Camry, sales of which amounted to 388,618 pcs. Studying the pickup market, the experts made a rating of models that can be sold with the greatest benefit. The list included pickup trucks, which were produced in the period from the end of 1940s to the start of 1970s. The leader was Ford Big Window, model of 1956. Initially, this model could be purchased for USD 1,611, now the cost of a pickup is USD 65,000, which exceeds the original price by 4.034%. The Dodge Power Wagon pickup trucks, which were manufactured from 1946 to 1956, are now also priced at USD 65,000, which is 3,995% higher than the original value. A little less - about USD 55,000 - you can help out on the sale of Chevy Pickup - the difference in price also reaches 3,909%. 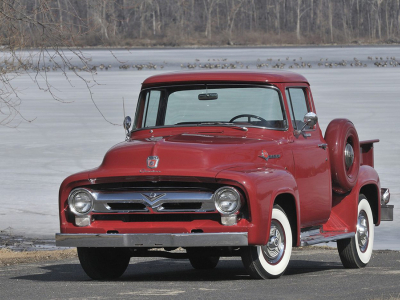 In addition, Hudson Pickup as manufactured in 1946-1947 can be sold for USD 45,000 (+3 899%), Studebaker Pickup as manufactured in 1946-1948 for USD 37,500 (+3387%), Chevy Cameo as manufactured in 1955-1957 for USD 60,000 (+ 3,028%), Dodge Sweptside as manufactured in 1957-59 also for USD 60,000 (+2 824%), Toyota Land Cruiser as manufactured in 1963-1973 for 75,000 USD (+2 370%), Chevy Pickup as manufactured in 1970-1972 - for 45 00 USD (1,819%), Ford Bronco as manufactured in 1969-1972 for USD 50,000 (+1 764%), and finally Chevy Blazer as manufactured in 1969-72 for USD 45,000 (+1 577%).